Highway and bridge contractors added 21,600 more workers to their payroll in June 2016 compared to June 2015, according to the latest data from the U.S. Bureau of Labor Statistics. Though this is the highest level of June employment since 2007, jobs in this sector have remained at relatively low levels for the past seven years. 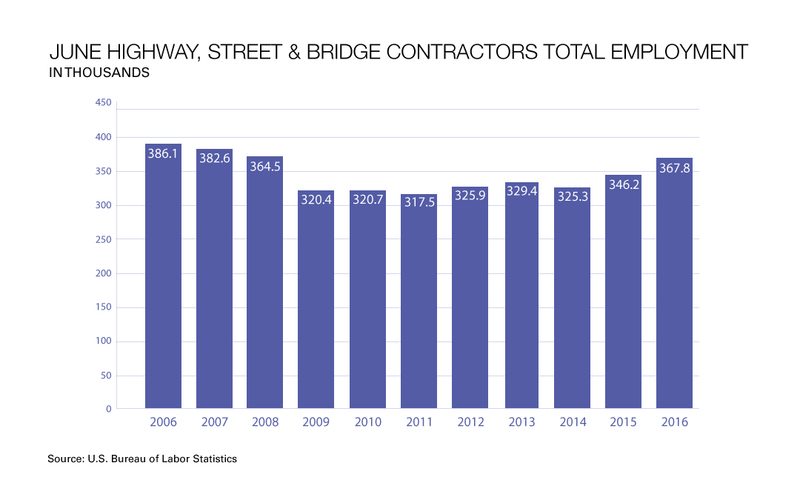 June 2016 highway and bridge contractor employment is up 6.2 percent from June 2015, but is still down 3.9 percent from 2007 pre-recession levels. Year to date, 2016 highway and bridge construction employment is up from 2015 levels, but is down 5 percent from 2007 pre-recession levels. The increasing employment levels in recent years are in line with overall market trends in highway and bridge construction. The value of highway and bridge construction put in place measures estimated actual construction by month. Despite a slight decrease in highway and bridge construction in June compared to June 2015, it is up by 6 percent year to date, and up by 17 percent compared to 2007 levels.